What's a better way to end a Sunday than with a delicious sundae? 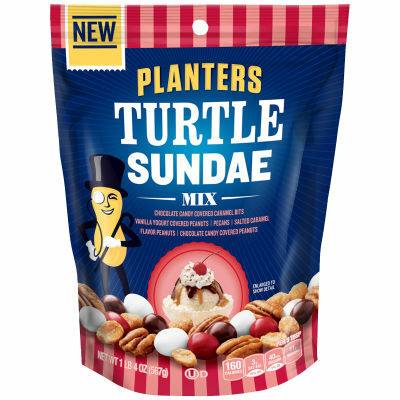 Planters Turtle Sundae Mix brings together the delicious flavors and textures of chocolate candy covered caramel bits, vanilla yogurt covered peanuts, pecans, salted caramel flavored peanuts and chocolate candy covered peanuts to deliver the premium taste of a Turtle chocolate. Greet your sweet-loving guests with this decadent sundae topper time and time again by resealing the 20 oz. bag.